Deep kneading massage rollers and Dynamic Squeeze air compression massage join blissful forces to combat foot fatigue and tension. Sit back and relax with a pre-set auto program that runs the soothing show. Relaxation is a step away with the Brookstone Shiatsu Foot Massager with Heat. 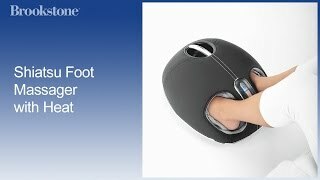 An easy way to renew feet at the end of the day. Deep kneading massage rollers and Dynamic Squeeze air compression massage join blissful forces to combat foot fatigue and tension. Kneading massage rollers work out sore spots and stimulate key reflexology zones, while dual air compression massagers apply gentle pressure through squeezes to boost circulation and ease tension. All that foot-renewing relaxation is built into a streamline massager that works easily in any space. We believe treating yourself to a massage doesn't have to be complicated, so our F4 Foot Massager with Heat is easy to use (and move) just about anywhere. The streamline design is enhanced with a sturdy grab-and-go handle and a back lit control panel that sets the massage course while you sit back and reap the soothing and relaxing benefits. 24 air chambers surrounding the thighs, calves and feet rhythmically expand and contract, and are designed to reproduce the gentle squeezing of a massage therapist to help increase circulation. Shiatsu massage is a Japanese massage technique that uses circular-motion and deep-kneading pressure on targeted acupressure points to help release tension and ease sore, tight muscles. Turn on the warmth to ease tightness, boost circulation, and help achy muscles (and the rest of you) relax more deeply.